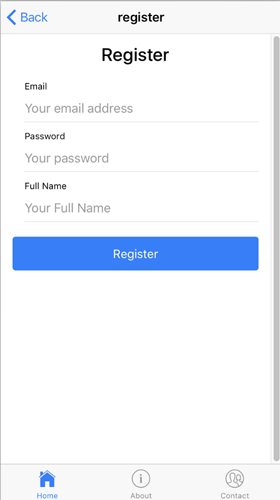 Full step by step tutorial about Ionic 2 Firebase Email Authentication, based on latest Ionic 2.0.0-rc.4, Typescript 2.0.9 and AngularFire 2.0.0-beta.6. 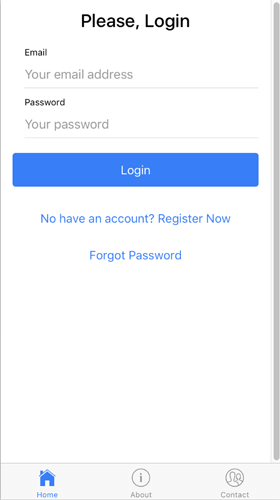 Ionic 2 Firebase authentication using email and password is one of the authentication methods in firebase. This will be a good practice for Ionic 2 apps since it's supported AngularFire very well. There are several authentication methods that firebase provided. Right now, we just using standard Email/Password method for authenticating to our app and accessing firebase database from our app. Let's start the engine. For smoother tutorial progress, please update your latest Ionic 2 installation by this command. Create a new project using this command and give a name (mine is "Ionic2FirebaseEmailAuth"). That command will create a new Ionic project with tab template and run "npm" install automatically, just wait until finished. Go to the folder that created by Ionic start. Install required dependencies and plugins. Open src/app/app.module.ts. Add import AngularFireModule in import line under TabsPage. Initialize firebase by adding firebase config under import section. To fill those configs, go to your console.firebase.google.com. ApiKey is found at Setting (Gear Icon) -> Project Settings -> General Tab, you can pick Web API Key for this. AuthDomain fills with "projectID.firebaseapp.com" where projectId is found above Web API Key. DatabaseURL is found in Database menu. StorageBucket is found in Storage menu. Next, call this firebaseConfig in imports. For connecting between Ionic 2 app with Firebase, we need to create a service. Create a service by this command. Now, register this provider in src/app/app.module.ts. Add import to this new provider. Declare in provider section of @NgModule. Next, edit the generated src/providers/auth-service.ts. Import firebase module in the header of the file. Add this fields to authentication and hold user data. Initialize them both in the constructor. Create new function for login. Create new function for the register. Create new function for reset password. 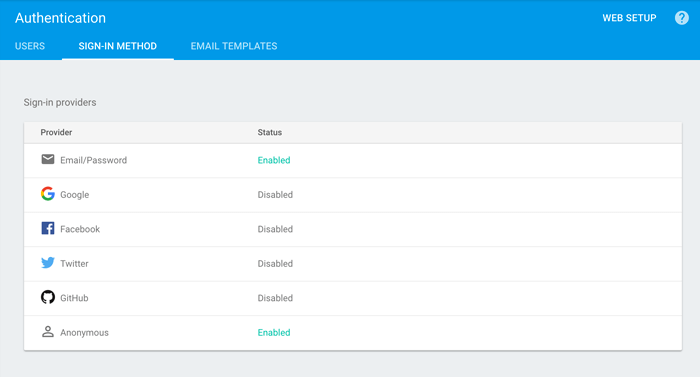 And the last, create the new function for logout from firebase. With above configuration in an app, now we should change the configuration in console.firebase.google.com. Go to your app dashboard then choose authentication. Choose sign-in method tab and click Email/Password. Click save and you will see sign-in method change. This enough for configuration, next let's go to the app. In this tutorial, we need a new login, register and reset password page. Just type this command to generate sets of the login page. Register this new login page in src/app/app.module.ts. Add the import in this file. Add this line inside declarations and inside entryComponents of @NgModule. Next, we have to create a restriction to the landing page (home) for an only authenticated user. We have to import login page and firebase in pages/home/home.ts. Then add this filter code inside constructor. This code will redirect to Login Page if no user found/login. Next, open ../pages/login/login.html to add login form. Replace all generated html with this code to login.html. <ion-input #email formControlName="email" type="email" (change)="elementChanged(email)"
<ion-input #password formControlName="password" type="password" (change)="elementChanged(password)"
Give a little style to fit the page in pages/login/login.scss. Now, the login page should be like this. Replace all codes in pages/login/login.ts with this codes. Inside this code, there is a form validator (Angular 2 built in), login function and navigation to register and reset the password. Next, we have to modify register page. Open pages/register/register.html and replace with this code. <ion-input #fullname formControlName="fullname" type="text" (change)="elementChanged(fullname)"
The style for this page is same as the login page, just place same code as login page inside pages/register/register.scss. Now, the register page looks like this. Replace all codes from pages/register/register.ts with this codes. Generated class for the Register page. This codes almost same as login.ts, but this only for the register. Next, we have to modify reset the password. Edit pages/resetpwd/resetpwd.html and replace all with this codes. For style just copy paste same code from register.scss. Next, replace all codes from pages/resetpwd/resetpwd.ts with this codes. Generated class for the Resetpwd page. Reset password mechanism handled all by firebase. When you send email for reset password, firebase will send email contains reset link to your email then you can follow rest until your password changed. Oh wait, one thing left is logout. We will put logout button in home page so add this code to pages/home/home.html in ion-navbar under ion-title. Don't forget to add function to home.ts also importing AuthService. 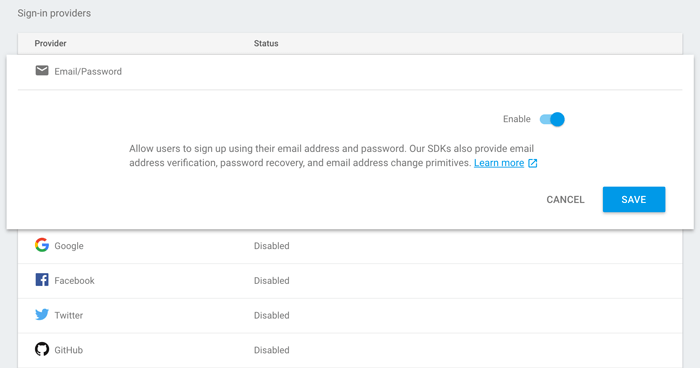 That's all required steps for making your Ionic 2 Firebase Email Authentication. Now, you run your app in the browser by this command. Or in Emulator, by this command. Notes, this plugin created for use in mobile devices so if you run on browser there will be so many warning and error comes. For example after register and login will show up error warning event login or register successfully. Also, it's not working for reset password. If you more comfortable learn this tutorial by full source code. You can get it from my GitHub.